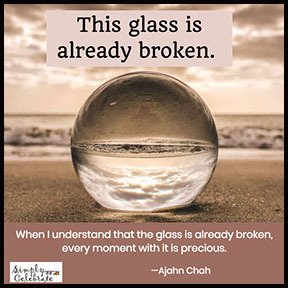 Your glass is already broken. We know that everything changes. That we change. That all life is always in a state of flux. Yet, doesn’t it seem to be that one of the things that causes us such suffering is resistance to and fear of change? We lose a favorite ring that our grandmother gave us. We become ill and can no longer move the way we used to. Our beloved friend or family member passes away. These things are incredibly painful. How do we find a place of acceptance in these kinds of changes? Is it possible to find joy in difficult times of our lives? To me, one of the answers lies in the full quote that I’ve recorded for you on video. I hope you’ll watch this three-minute clip I recorded during a Facebook live the other day. Look around you right now, right here. Who or what do you love? Now, imagine that person or thing is no longer a part of your life. They are already gone, lost, or broken. Now, can you love that person or thing fully and completely? Can you celebrate them now?